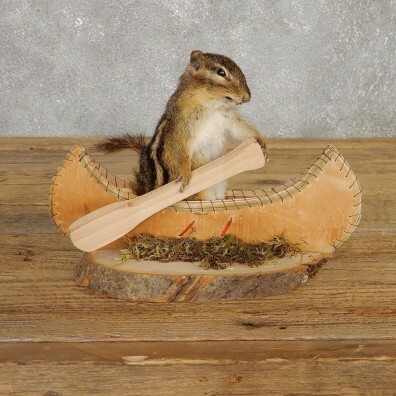 This is a terrific Novelty Canoe Chipmunk taxidermy mount, posed paddling his small birchbark canoe into the abyss. This piece features a handmade birchbark canoe that adds to the overall piece. This would make a great gift for a loved one or friend. The fur quality and color are both outstanding, as is the craftsmanship. 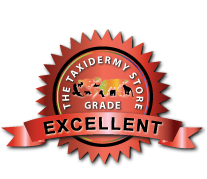 All of this combined has helped this item earn our Excellent™ overall quality rating. All applicable dimensions are included to help ensure this item will fit within your intended display space. - Includes a wood base for display. - Perfect for the shelf, mantle, table, counter top, etc.. The Eastern chipmunk (tamias striatus) is a small rodent found primarily in North America with it's only other relative located in Siberia. These woodland creatures spend most of their day hunting for worms or other small insects and gathering seeds, nuts, and fruits in preparation for the winter. The chipmunk can climb trees but prefers to burrow in the ground for protection, creating long winding tunnels with several exits for a quick escape. Predators include weasels, snakes, fox, and bobcats, as well as common house cats.